approximately 350 homes and have spoken to @two dozen or more to get out and vote. In the SW Las Vegas field office we wandered neighborhoods with lists of registered democrats. We only knocked on their doors with the purpose to GOTV, first for early Nevada voting, and then for election day. Most of the time I had partners. I canvassed with Joel from LA, Joe from New Jersey, Sarah from Blue Diamond, NV, Melanie from Orange County, Lauren from Brentwood, Ara from Berkeley, and Elliot from Sherman Oaks. Hundreds of people have come from out of state. I met Charlie over Shabbat, an observant Jew from LA who works for the culinary workers union and is out there with 100 canvassers from his union every day through tonight. 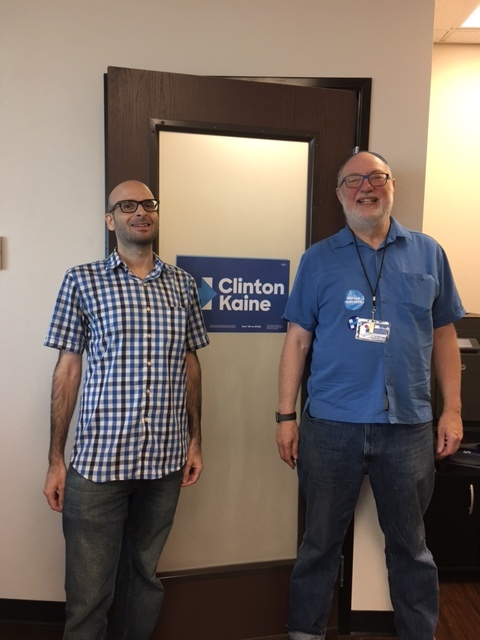 I also ran into Andy from Seattle who like me was saying Kaddish for his father at the local minyan while canvassing for Hillary at another field office. What a wonderful feeling of solidarity and a wonderful way to make new friends. Yes, there is a downside. On Sunday I was threatened by a man who demanded I get off the property of his gated community and hounded me off his front yard in menacing tones. I got yelled at by a woman who was angry that I knocked on her darkened door after sunset without seeing the “No Solicitors” sign. Canvassing has a degree of unpredictability, but it is a basic form of democratic advocacy. Most of the people we met were gracious or polite even in the few cases when they told us they were not voting for HRC. In a few hours the decision will be made. I am glad I had a small role in supporting HRC in an important battleground state.